Vintage Tubes Bring the Spice! Over the years I have slowly been finding vintage tubes for my older amps. One amp I wrote about on this site was a custom Fender 5E3 Tweed Deluxe that I commissioned from a regional builder a year ago. You can read about that over HERE. In that case, the tube-finding process started the very first week after the amp was delivered. Understandably, the builder preferred to load the amp with all-new tubes so that he could know that it would arrive at my door in working condition. However, while researching the Tweed Deluxe I had heard that new-old-stock tubes would have a pretty profound impact on its sound. Even though I was a little skeptical I decided to try some tube changes, and the search was on. Firstly, the Tweed Deluxe is well-known for its sustain. The word on the street was that despite published specs which are nearly identical to those of modern tubes, an NOS rectifier tube would greatly enhanced the sustain of the amp. So, I first sougt out an NOS vintage GE 5Y3 rectifier tube. Sure enough, the amp's sustain became much more "pillowy." Not just a little, but a LOT. A little more of the pretty sound I'd heard on recordings immediately began to appear. My builder also fitted the preamp with a pair of modern JJ 12AX7 preamp tubes. Some people prefer this combination because it makes the amplifier break-up earlier but the circuit was originally designed to have a lower-gain 12AY7 in v1 and a 12AX7 in v2. In this case, with the 12AX7 pair in place, the amplifier sounded a little too hard, grainy, and bratty to me. I was off on the next quest. While I was doing research a friend dropped by and gave me an Electro-Harmonix 5751, a 12AX7 variant that dropped the front-end gain by 30% when compared to the 12AX7. When I tried it in v1, I immediately noticed a lot of smoothing to the sound. But on the advice of several Tweed lovers I went ahead and took it on down to the original spec of 40% less than a 12AX7 via a modern Electro-Harmonix 12AY7. That tube has a nice, balanced sound to it and has lowered the gain enough to remove the grainy, bratty sound as well. As I said in the article about the commission, in this case, less is definately more. The lower gain tube made this amp sound very much like the 1950s Deluxes. Once I got settled into a preamp tube array, a friend brought me a small trove of old 6V6 power tubes (Delco (RCA), RCA, and Truetone) that refined things even further by smoothing out the response of the power section. The Tweed Deluxe amp is the perfect vehicle for power tube experimentation because it features "cathode biasing" that doesn't require bias adjustments for each set of tubes you try. You can just pop them in and out like you would with preamp tubes. Fixed-bias amplifiers require that you tweak the bias for each power tube change, which takes more knowledge, experience, equipment, and time. Interestingly, though it was considered a cheaper and thus an inferior bias scheme, cathode biasing is part of what gives this amp its sparkly, interesting sound. The latest little score happened when a friend who is a real tube fan dropped by my studio. He handed me one af his latest finds: a bag of used, vintage 12AX7s, and said, "Try them out. There's a vintage Tung Sol USAF JAN 12AX7WA tube and a bunch of others. Pick two." The “WA” suffix denotes a JAN (Joint Army-Navy) military-spec variant of the 12AX7 that strengthens the internal physical supports and features lower noise. I tried out these tubes in v2 in place of the stock JJ and settled on the Tung Sol and an old GE, both in excellent shape. The Tung Sol offers a little more gain and distorts with a smoother, "creamier" distortion than the JJ. Its sound reminds me of some of the lead sounds from Don Felder's latest album, Road to Forever. The GE offers a little lower gain than the Tung Sol but sounds more "bell-like" and seems to sustain in a very pretty, clear way. This one is more like Felder's sound on "I Can't Tell You Why" from the Eagles' The Long Run. I’m impressed by its clarity when compared to the JJ that came in the amp, which has a "harder" sound when compared to either of the vintage tubes. It seems like a good thing to have options, and now I have three. While I was frittering with the Tweed Deluxe, I also tried out a selection of 12AX7s in the '73 Traynor YRM-1 Reverbmaster. The dealer I bought the amp from had noticed a little bit of "sogginess" in the distortion offered by the amp when gained-up. A modern 12AX7 took care of the sogginess but imparted a hardness to the sound but a higher-gain vintage tube proved to be just what the situation needed: strength and smoothness. By the time my experiments were over I'd done a regular "round-robin" and exchanged tubes between several of my amps. I was amazed by the subtle differences that a single tube can make. I also confirmed the marked difference in sound between modern and vintage tubes as well. Now, these are all just personal, aesthetic choices. They can be fairly esoteric, so don't be afraid to use your ears and your own tastes as you make your own choices. 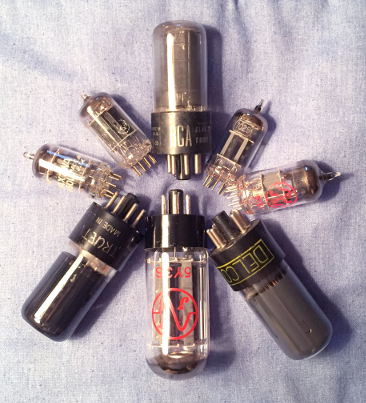 So next time you are at a flea market, try looking for old tubes for your amps. You can often find them for a song and a dance. Take them home and try them out in your amps to see if they can give you a different, and possibly more pleasing, sound. One note: Get into the habit of always inserting and removing tubes with bases by pulling on the base rather than the glass. Especially in older tubes, the glue holding the glass envelope into the base can dry up and release as you tug. That breaks the fine wires that connect the tube to the base and ruin the tube. I've got a great Philco tube sitting in my control room that will never work again because someone pulled it out of the socket by the glass.